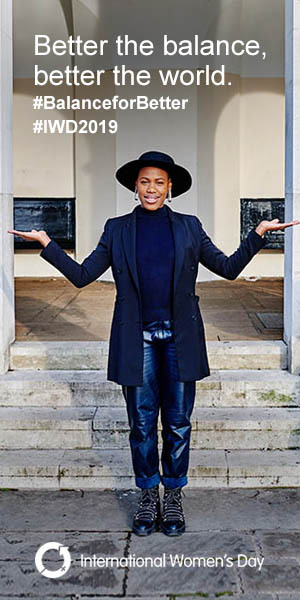 In true best practice style, international law firm Simmons & Simmons captured a meaningful, artistic suite of photographs for International Women's Day that drew together the strong commitment and deep passion of its people. It's artistic appeal is also exciting, so well done Simmons & Simmons! To celebrate an array of purposeful International Women's Day activity across countries, Simmons & Simmons captured an important moment in time via an exciting artistic photographic collage with impact. 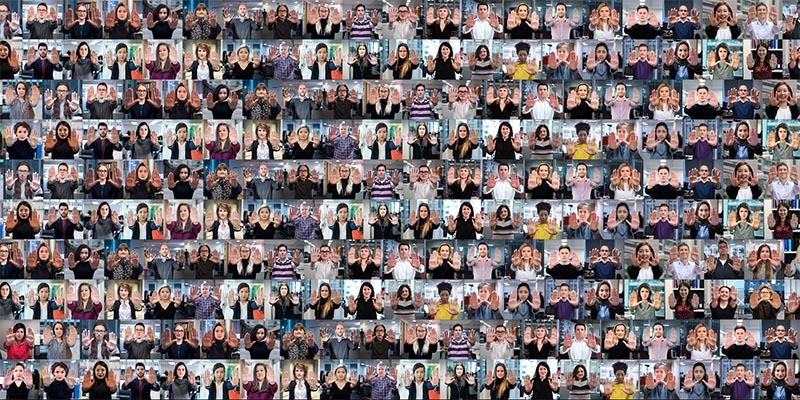 Over 50 Simmons & Simmons employees embraced the 'hands out' #PressforProgress pose (pictured above) as part of a collaborative project that produced exciting visuals shared across internal channels and social media. 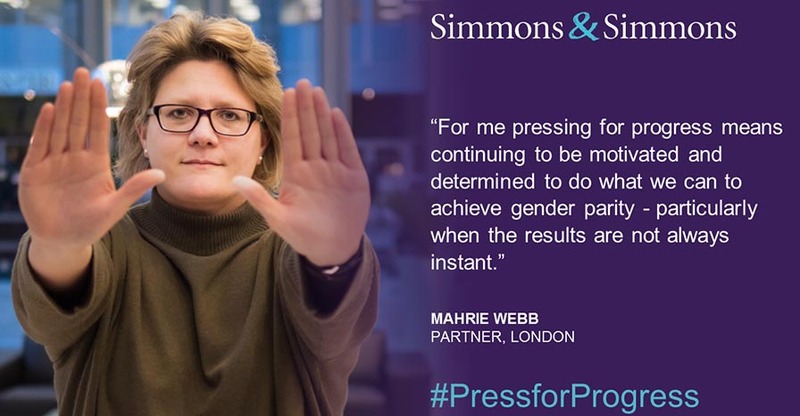 Simmons & Simmons, a truly diverse and inclusive firm, recognized International Women’s Day as the perfect opportunity to bring together their international community, from offices in Hong Kong, Paris, Milan and further locations to collaborate on ways the firm could collectively #PressforProgress. Simmons & Simmons, well beyond International Women's Day, continues to develop meaningful initiatives that encourage and support female progression and the firm maintains an inclusive environment where women feel confident they have a voice. 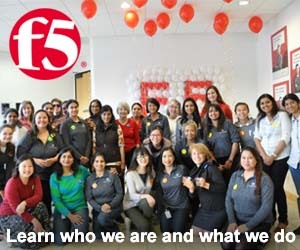 To mark International Women's Day, events were organised throughout the firm's international network of offices - from Singapore's engaging Ted Talk event, to Paris where the President of the French National Committee for UN Women, Miren Bengoa, engaged with a plea for greater equality. 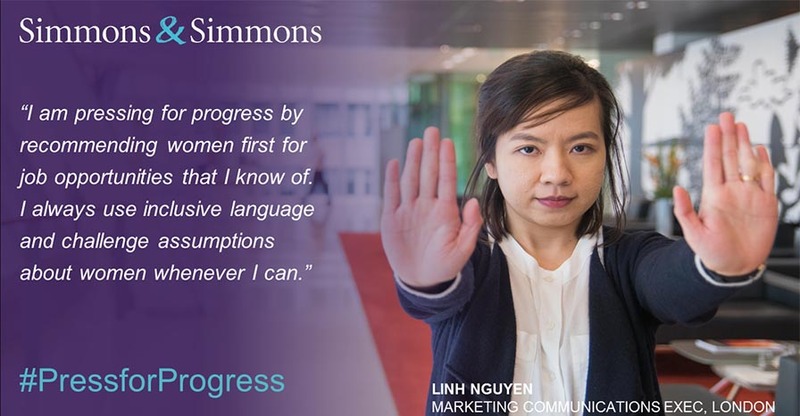 Simmons & Simmons employees were encouraged to identify how they, individually, could #PressforProgress and they were encouraged to share their goals globally, on key platforms. Empowered by the International Women’s Day campaign theme, the entire firm stepped up to support their #PressforProgress events in order to truly impact change. 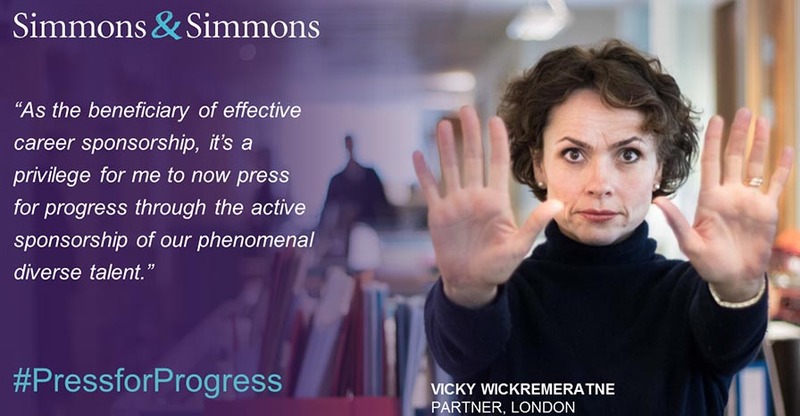 International law firm, Simmons & Simmons, achieved significant employee engagement to #PressforProgress for women's equality, captured in an artistic photographic collage. 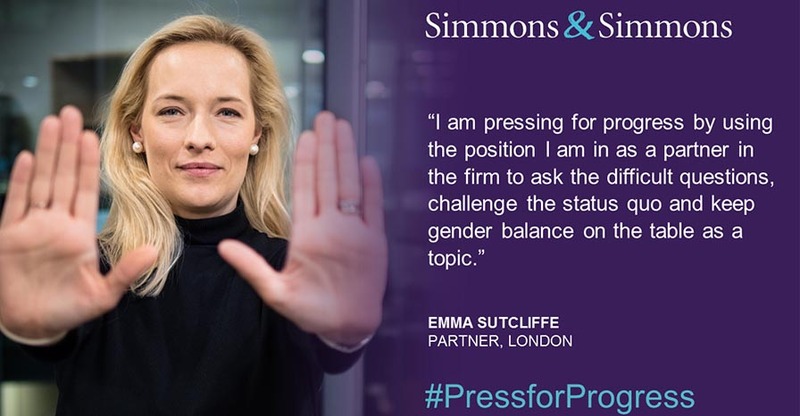 Simmons & Simmons took an innovative approach to International Women's Day by calling on colleagues of all genders, to be individually responsible for pressing for progress in their own way. They then showcased this in an engaging slideshow of images of individuals with their quotes of commitment at both internal and external events, to ensure they were not only inspiring people within the firm but those outside of the firm too. As part of the firm's International Women's Day campaign, several partners also wrote a series of thought leadership pieces designed to discuss gender balance and demonstrate how the firm can strive for betterment. “I am pressing for progress by seeking to ensure that woman are full represented in all aspects of working life. This includes featuring women on panels, at events and as key spokespeople. I believe pressing for progress is about seeing equal representation at all times,” stated Charlotte Lindsay, Events Manager. The firm’s pledge to support women in their careers, however, moves beyond just one day. 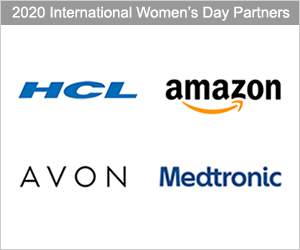 Their impressive agenda of support for women includes a sponsorship programme that pairs the most senior partners with female associates as a way to break down barriers and open doors to new opportunities, which otherwise might not have been possible. Additionally, The Number One Club (TNOC), the firm’s women’s network, this year celebrates ten years of providing support. It delivers a platform for people across the global employee community to network. The forum holds internal events with guest speakers often working in partnership with its key clients. Simmons & Simmons is invested in retaining and developing associate talent, and they recognise the importance of promoting understanding of the partnership role. In their ‘demystifying the partnership’ series of events, small focus groups gather with partners to raise associates’ awareness and understanding of the partnership role. Partners provide an honest view of their role, offering advice on what associates should be doing in order to achieve this promotion. 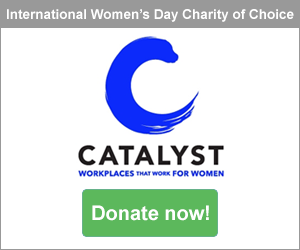 Importantly, the firm used the importance and relevance of International Women’s Day to continue to showcase remarkable efforts that support awareness raising and action for gender parity. 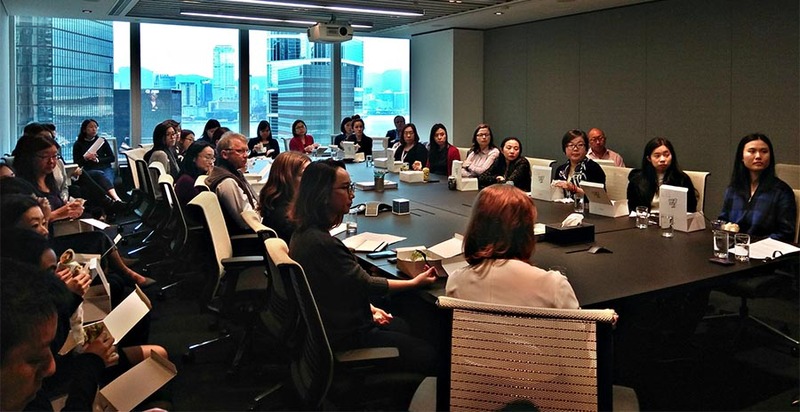 As part of Simmons & Simmons' International Women's Day celebrations, a TED Talks event was held in the firm's Hong Kong office. Simmons & Simmons has deservedly received recognition for its efforts in supporting gender balance. 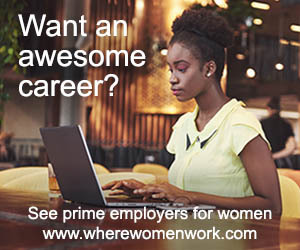 Key accolades include: Top 30 Employer for Working Families, The Times Top 50 Employer for Women and a Stonewall Top Global Employer. Senior partner, Colin Passmore, has also been ranked at #25 in the FT and HERoes Champions of Women in Business list. All very impressive! Around the world, groups everywhere provided fascinating and powerful photographs of their #PressforProgress activity as they championed International Women's Day. Take a look at some of the remarkable imagery from across the globe.